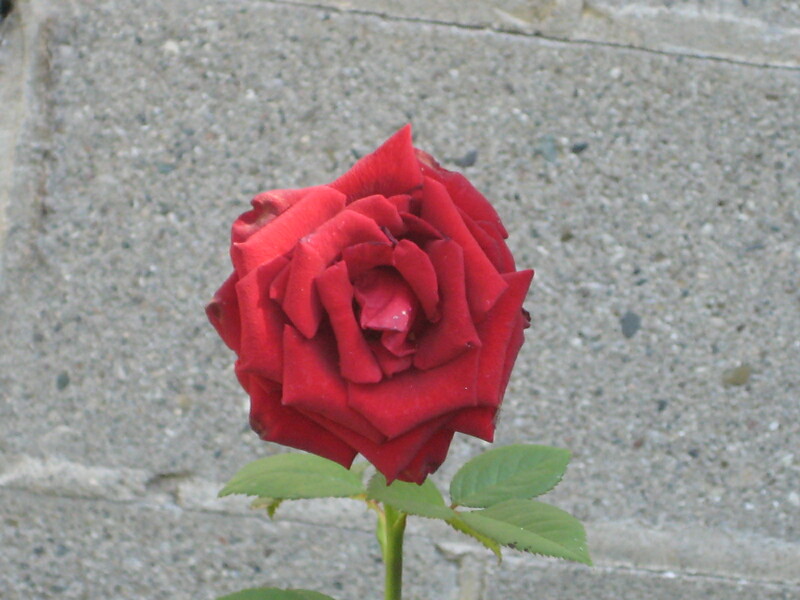 This is a picture of my sister’s rose bush in bloom. It was given to me by a neighbour for my birthday the year after Janet died. It’s appropriate because red is Janet’s favourite colour. I go and put flowers on the grave on our birthday but it blooms too late to do that so I put it on the table and remember her. The garden is full of memories of my Dad and sister. Lily of the valley is her favourite scent and when it was in bloom we could smell it as soon as we walked out from the basement. I love the smell of lilacs. One day my Dad had me pull down a branch to snip some off for a friend. Well the branch must have been weak and I pulled down the entire branch. Oh I was afraid I was going to get it but Dad said it happens. He told me to put it in water in a bucket and share with my friends. I put some in a vase when my Dad was at home when he had cancer. My Dad tried to grow vegetables but he didn’t have any luck because the squirrels would eat them. We had a rhubarb patch. I liked rhubarb ok but was glad we didn’t have a very big patch. We also had black currents which are a pain to pick and only 2 people in our family like them–Dad and Janet. I find the flavour too strong. We had a compost pile (basically a big hole in the ground) where we would put leaves in the fall. Occasionally we would have to stamp the pile down. That was Janet’s job. Picture the I love Lucy episode where they are stomping grapes. It’s not just grass and flowers, it’s their voices whispering to me.